Sized perfectly for your little ones’ mitts, Bambu’s line of kid and baby-sized utensils are as cute as they are eco-friendly, durable, and functional. Made from certified-organically grown bambu, Bambu’s kids line is the first-of-its-kind, providing a great alternative to the usual plastics. They’re stronger than wood, heat and stain resistant, won’t absorb flavors, and durable enough to withstand a toddler tossing them across the room. And for your budding culinary geniuses, there’s a Kids In The Kitchen Tools line as well- kid-sized spatulas and more. What's with the surprise over bamboo? We've been using bamboo cutlery & cooking utensils for ages here in Japan. It's nothing new! Bamboo is very flexible yet extremely tough and infinitely adaptable. It's about time westerners opened their eyes to the many uses of bamboo. And it doesn't need to be "certified organic" either! these look and probably feel great, the chinese have been eating from wood and bamboo for thousands of years and they dont seem to be dying off,far from it , anyway kids need a few germs, keeps them lively. These are GREAT! So lovely, they look like they'd be really comfy to hold & use. I like even more that they're produced from certified-organic bamboo. marvellous. I love bamboo & wood cutlery & cooking utensils. I use it as much as possible. As long as wood is allowed to dry out completely after being washed in hot water (& perhaps oiled once in a while to stop them from cracking), it's a _very_ hygenic material to use (more hygenic than plastic, believe it or not, especially when it comes to chopping boards). It's been used for generations prior to plastic cooking & chopping utensils. thanks for a creative, one of a kind baby gift idea: bambu baby fork and spoon and a set of mini bowls! after viewing the page on the branch.com site with all the bambu products, i'll also be able to finish up all my christmas shopping. I dunno about wooden utensils for either food preparation (e.g. chopping block/cutting board) or consumption (these^^). I've always be warned to be weary of bacteria in those. They find a nice comfy nesting place in porous materials like woods. 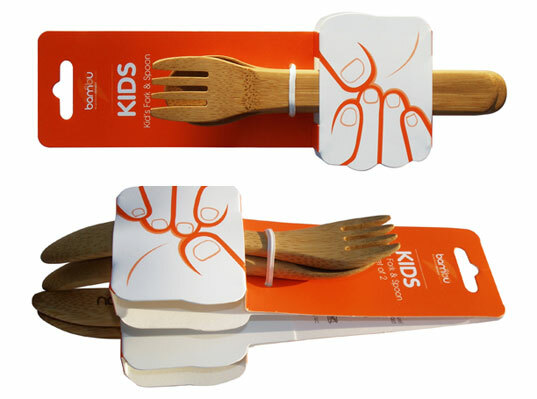 Sized perfectly for your little ones' mitts, Bambu's line of kid and baby-sized utensils are as cute as they are eco-friendly, durable, and functional. Made from certified-organically grown bambu, Bambu's kids line is the first-of-its-kind, providing a great alternative to the usual plastics. They're stronger than wood, heat and stain resistant, won't absorb flavors, and durable enough to withstand a toddler tossing them across the room. And for your budding culinary geniuses, there's a Kids In The Kitchen Tools line as well- kid-sized spatulas and more.